In investing, it’s just as important to know what to buy as what to avoid. 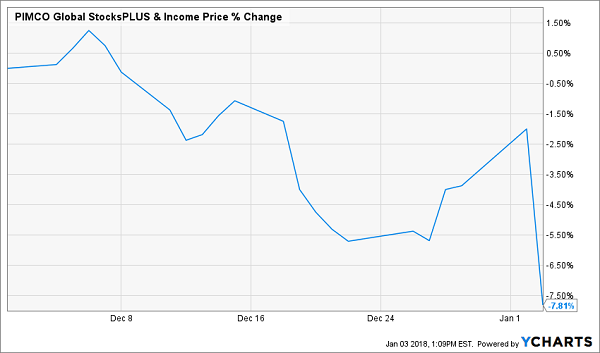 And if there’s one thing you need to keep away from at all costs, it’s a dividend cut like the huge 16.8% slash the PIMCO Global StocksPLUS & Income Fund (PGP) announced on January 2. It caught first-level investors completely off guard (though it shouldn’t have, as I’ll explain in a moment). If you’re a regular reader of my articles on ContrarianOutlook.com, you’ll recognize PGP, a PIMCO fund that mixes stocks and bonds to give investors the biggest dividend possible. Aside from the dividend cut, there’s one other thing that amplified PGP’s recent plunge: even though the fund’s underlying portfolio hasn’t done much, the income-starved hordes have been pumping cash into it, causing the market price to be far higher than the fund’s net asset value (NAV, or what its underlying portfolio is worth). That was one of two factors that put PGP on my sell list back in June, 6 months before this latest dividend cut kneecapped the shares. That didn’t stop some readers from writing in, saying they still had faith in PGP. So I wrote about the fund again at the end of June, after it had fallen 9.6% since my first warning earlier in the month. Again I advised staying away. “With so many risks at work, there’s just no reason to buy PGP,” I wrote. Fast-forward to today, and the second payout cut I predicted in June is now a reality, having been announced on January 2. The big drop at the end of the blue line in the chart above shows you just how steep the resulting selloff was. PGP’s new monthly distribution is now $0.122 per share—down 16.8% from $0.1467 before. Before the cut, investors were feeling good about their 18.9% dividend yield. But good vibes about massive yields like that usually turn out to be a short-term fling, because those dividends are unsustainable, and they inevitably fall. How did I know PGP’s dividend was going to get cut? Why didn’t the rest of the market know? What will PGP’s future look like now? CEFs can make a profit to pay out to shareholders in two ways: capital gains or income. Capital gains come when an asset goes up in value; the fund can then sell those assets and hand out the gain to investors as a cash distribution. Income, on the other hand, can come from a variety of sources, such as interest payments on a bond or loan, or dividends on a stock. In PGP’s case, the fund was earning both capital gains and income to pay out its dividend. The problem was that its gains and income weren’t enough to match the fat dividend checks it was sending out to shareholders. I don’t blame PIMCO. They warned investors by being more transparent about the fund than most managers are. 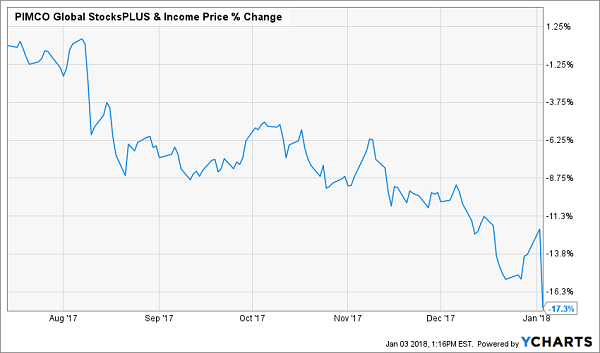 By the end of November 2017, PGP’s net investment income was just 90.12% of its year-to-date dividend payouts, meaning it was under-earning its dividend by a pretty big margin. Even so, PGP didn’t have the worst distribution coverage in the PIMCO stable (there were 5 funds with less coverage than that of PGP). But PGP was an intolerable offender because its dividend yield was so ridiculously high, which means every month that it failed to earn its dividend, its NAV suffered. This is because the fund had to take cash out of its portfolio to sustain its dividend instead of giving investors income from its investments—essentially returning investors’ own capital to them, making the fund poorer. Thus, a dividend cut became more and more necessary with every passing month. And so here we are, with a dividend cut, massive capital losses in a day and a lot of anxious income investors. It shouldn’t be like this. And it doesn’t have to be like this. So Is PGP a Buy Now? So is PGP’s new, lower payout sustainable? At $0.122 per share, it comes out to an annualized yield of 9.9% on the fund’s NAV. And PGP’s new distribution coverage ratio has jumped from 90.1% to a massive 182%. All of a sudden, PGP has the safest dividend in the PIMCO universe! That means a dividend cut isn’t coming anytime soon, which is good. But it’s still not time to buy PGP—and the reason why comes back to the fund’s premium, which I mentioned earlier. 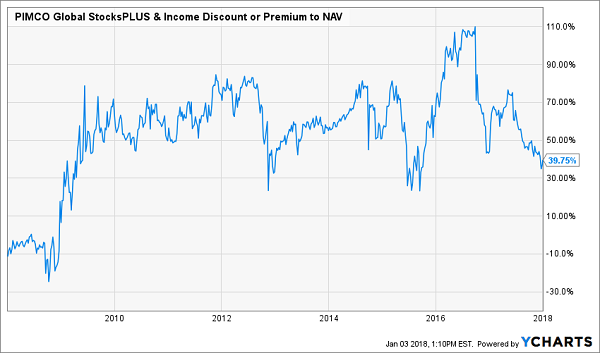 When PGP cut its dividend in the middle of 2016, its ridiculous 105.9% premium to NAV crashed to a “modest” 37.4% premium—pretty close to its current 31.2% level. PGP’s 2016 premium didn’t fall lower than 37.4% because the market thought (wrongly) that the fund wouldn’t cut its dividend again anytime soon. Remember, prior to October of that year, PGP had never cut its payout before, so the odds of another cut in the near term were small. Yet PGP went ahead and slashed its dividend just 15 months later. That throws the stability of PGP’s dividend out the window. PIMCO has proven they will cut the dividend more than once. The market is betting that greater fools in the market will forget that fact and buy in over the next few months. But don’t be surprised if the market is wrong—and PGP falls to a lower premium. Until that happens, no matter how good that 9.9% dividend looks, this is a fund to avoid. But there are many reasons to buy 4 other CEFs I urgently recommend you snap up now. Let’s start with the discount: unlike PGP, these 4 under-the-radar funds trade at massive (and unusual) markdowns to NAV. When they snap back to “normal,” their share prices will catapult higher too! We’re “pre-loaded” for easy 20% price gains in 2018! And when you tack on the 8.1% average CASH dividends these funds throw off, we’re talking about a 28% total return in the next 12 months. Remember, that’s just the average—some of these 4 superstar funds are primed to soar even higher! 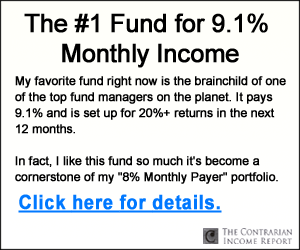 And one of my rock-solid CEF picks even pays a SAFE—and growing 10% dividend! I’m ready to GIVE you everything I have on these 4 life-changing picks. 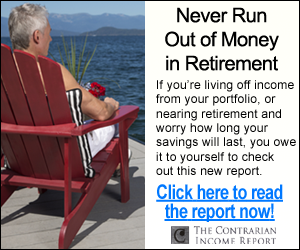 Click here to get my complete research—names, tickers buy under prices and absolutely everything you need to know about these retirement lifesavers before you buy!